August 2012 – on my way: make it someday. I had to leave Montpellier at 6 a.m. on Saturday morning and drag my bags through the street to the tram station, a ten-minute ordeal that left me sopping wet and disgusting. I was so happy that the train would be taking me to cooler climes. I rode to Lyon, switched stations, and then took three more trains before ending up in the mountains of Bavaria where Pam Pichler picked me up at the station – just as she did back in March when I arrived to report on World Championships. Back then, Pam had to leave the next morning to go to a conference in Las Vegas; luckily this time we had more time to talk. I was still exhausted so I quickly collapsed into the same big, comfy bed that I slept in last time around, joined by one of the family’s cats. In the morning, it really took all of my willpower to get out of that bed. It was raining and gray, but even then it was beautiful. I drank a lot of tea and lounged around the house with Pam and her husband Walter and daughter Malin, who made a delicious German plum tart from scratch; older daughter Nina was at her very first day of work. It was cozy to have a cup of something hot and look out into the drizzly valley. After lunch, my friend Susan, who was in town for a biathlon training camp, came over to pick me up and we joined her teammate Sara (both of them were my buddies on the Dartmouth Ski Team back when we were mere babes) and went on a little adventure. Somehow, this trip had aligned perfectly so that I was in town on their day off and actually got to see them. As Susan drove the van on narrow, winding roads through the hills and mountains, we caught up on everything: I told them about school, Sara talked about the classes she’s taking through the Keller School of Management, Susan said that she jumped in the pond-like “swimming pool” outside of their little cabin every morning and it had left her cold all day. 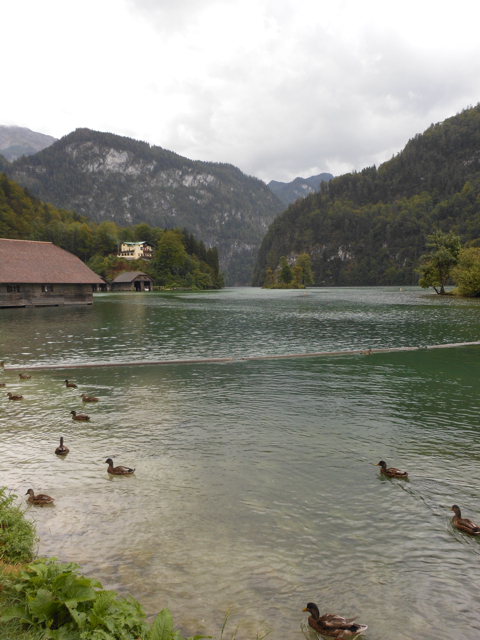 We parked outside of the Berchtesgaden National Park and wandered through little tourist shops until we ended up at the lake of Konigsee. I’m going to use this word a lot, but: it was beautiful! It’s a long, skinny lake that has clifflike walls in some parts, and you can take a boat ride where someone blows a horn at the cliffs and the echo comes back so perfectly that it sounds like there are two horns. We opted not to do this, but walked around the one end of the lake and admired the views. Looking at a map, we could see that there were trails up the steep slopes on either side of the lake, with huts to stay in or alms to eat at. Some time in the future, I really hope I get to come here and make a hiking trip out of it. The scenery is just spectacular. As you may know, the area also has an interesting place in history. It was here that Hitler had his Eagle’s Nest built, and you can see it atop one of the ridges near the lake. Again, we didn’t walk up there, but I’d love to read a little more about the history of the area in that era in particular before I come back. I will come back. 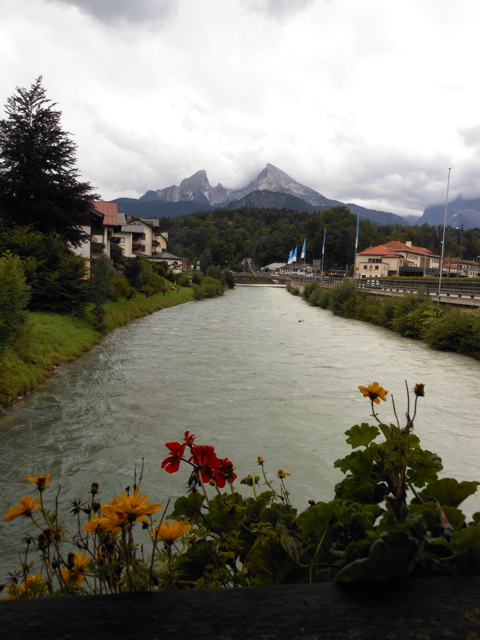 We drove down to the actual town of Berchtesgaden, which is perched on a hill. It took us a little while to wander our way to downtown. On our way we passed an amazing cemetery – they do things a little different in Germany than in the U.S. – and a beautiful church. Once on the equivalent of main street, we tried to look for a cafe to grab a coffee at, but this being Sunday afternoon most things were closed (and Berchtesgaden is small, so there weren’t that many shops in the first place). We had to settle on gelato, which was funny because it was actually kind of chilly. I selected hazelnut and am happy to report that it was delicious, even if it didn’t help my internal temperature. 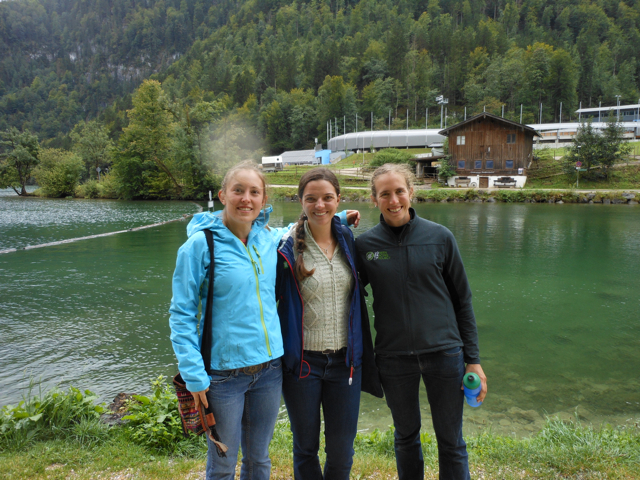 Of course, part of my trip to Ruhpolding was to work for FasterSkier, so after we drove back to Susan and Sara’s cabin I met up with one of their teammates for an interview before having dinner with the whole biathlon team. After Susan took me back to Pam and Walter’s, we drank more tea and talked for an hour or so. Susan and I used to do so many of the same things – running, skiing, ecology research, leading outing club trips – and we still have the same interests, but we’re adults now and we both have real jobs, I guess you could say. And we are both fascinated by each other’s jobs and curious about how all these things we love might be able to fit together into a real life. It’s amazing for me to be able to catch up with friends like Susan, especially in such a seemingly random place – I have had some pretty cool opportunities in the last few years. The next morning I ran up to the biathlon venue (my first exercise in a week, and I could tell….) to observe their training session and do more reporting work. (For lots of pictures of that experience, check here.) 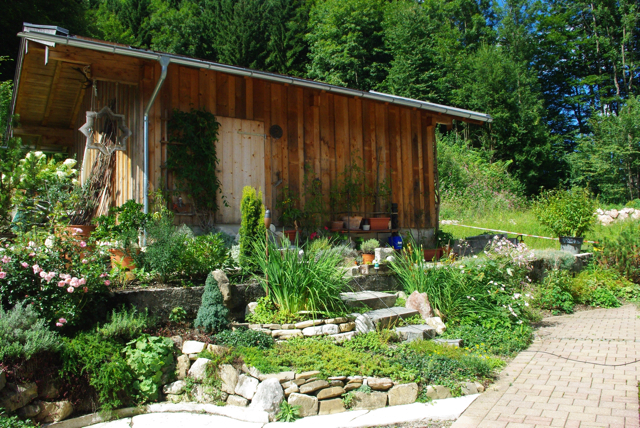 When I arrived back at the house Pam and Walter were sitting out in the garden in the sun. They have a little microclimate in their backyard which can grow nectarines, grapes, kiwis… what!? It was quite warm and lovely and I could have sat there for hours. As it was, I said goodbye to Walter, who was just home on lunch break from a job helping to renovate some houses one of his relatives owned. 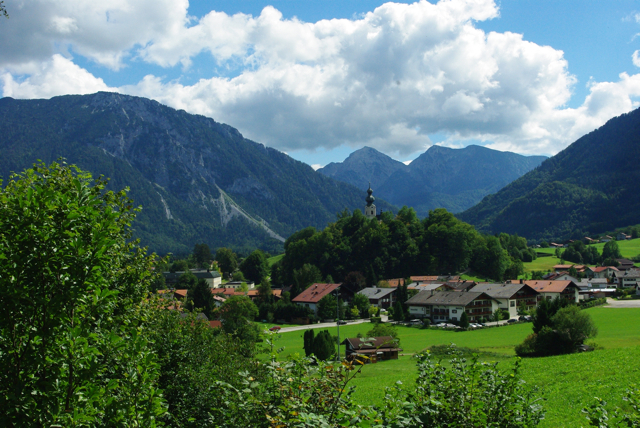 And then it was time for me to take a shower and re-pack my bags – just a short visit to Bavaria this time around. Pam and Malin drove me back down to the train station and I was off, wishing that I could stay much longer. I only met the Pichlers this winter through my old ski coach Dennis Donahue, who had worked at the U.S. Biathlon Association when Walter coached the national team, but they have become great friends and very generous hosts. 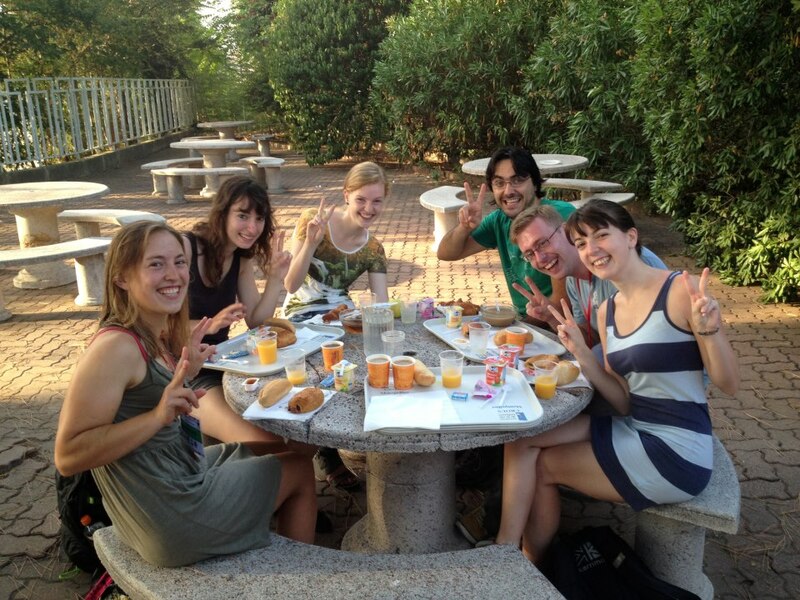 Again, it’s just another example of how lucky I’ve been in the last few years – how many people can travel to a tiny town in a foreign country and develop a real friendship with the people they meet there? I think the explanation is that I am blessed to have many kind and amazing friends of my own, who of course know more people like themselves. Thanks, world, for offering up so many wonderful things to me.